Meet the people who make it all happen--the planners, the photographers, the musicians who have helped orchestrate the perfect day for countless couples--as they find their own happy endings in the second Year of Weddings novella collection. Amelia Woods is a small-town wallflower and the proud owner of Forget-Me-Nots, a quaint flower shop that once belonged to her mother. Despite her success in business, her love life has always been a bit lackluster. Until she spies on her ex-boyfriend's wedding and ends up in a horrifyingly embarrassing fender-bender with handsome wedding guest, Nate Gallagher. Meanwhile, Amelia's younger brother, William, has proposed to his girlfriend. Amelia would be excited except she has evidence that the fiancee is not who she says she is. How can she be supportive and yet be the protective big sister too? It seems Nate is the only one available for any advice-giving, and he's good at it--and pretty fun to talk to, too. Amelia and Nate strike up an online relationship, but always lingering in Amelia's mind is the fear that he'll realize she's not nearly as appealing in real life. 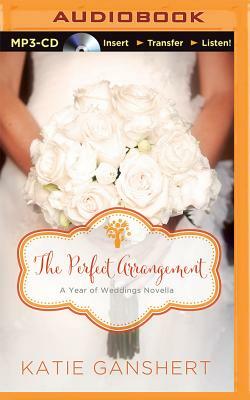 As Amelia works to craft the perfect flower arrangements for other people--including a ninety-year-old "fairy godmother" named George--she begins to wonder if real love is better than the dream. And if it is, will Nate still be interested when he learns who she is?